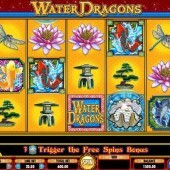 Tinkly Asian music, a nice watery FX in the background that made me want to go for a wee-wee every five minutes, and some of the nicest Oriental imagery since Microgaming's Asian Beauty slot: that's what you get from renowned online slot developer IGT's latest online jaunt across Asia - Water Dragons. Already a firm favorite with land-based slots junkies, the online adaptation is every bit as slick, and the free spins bonus round is pretty sweet too. So the background and the substance in the land-based department is there to ensure that this slot has a great chance of making the successful transition to the online platform. It also has the backing of IGT that is optimism enough for even the most pessimistic slots player. There are 30 paylines to go along with the slot's five reels, and fans of the aforementioned Asian Beauty as well as lovers of Microgaming’s sumptuous nature-fest, Alaskan Fishing, should get a kick out of this with its firm fishy theme. Koi Carp of various colors bulk out reels that also feature pagodas, Chinese characters and lotus blossom, although there's no dragon in here (the legend goes that the Koi carp swam upstream to become a fearsome dragon). Earn up to 225 Free Spins! Wild symbol is the Water Dragons symbol, and it only appears on reels 2 to 5, substituting for every symbol other than the bonus Scatter. Three bonus Oyster Scatters on reels 2 to 4 triggers a free spins bonus with 15 freebies awarded straight away. However, 15 more spins can be yours for hitting another three bonus Scatters during the spins, and 225 free spins can theoretically be yours. The Pearl Can Turn the Koi Wild! Look out in particular for the Pearl symbol, appearing on reel 5. When it does it turns any Koi symbol Wild. If you hit three Pearls you'll earn another Wild in the form of one of the coloured Koi. For example, three Pearls turns the Red Koi into an extra Wild, six Pearls triggers the Spotted Koi turning Wild, and so on. 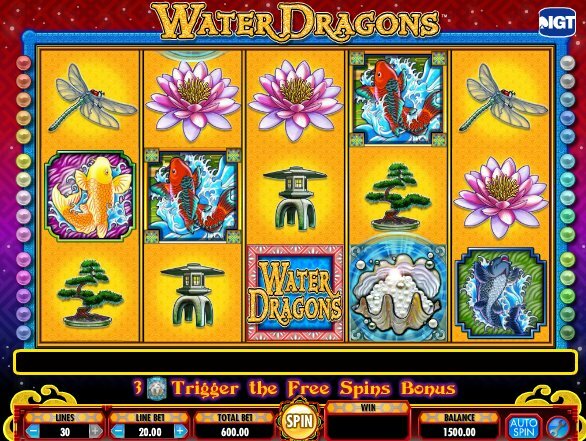 With 30 pay-lines and some whopping coin bets, Water Dragons is certainly not for the faint-hearted, but for big bettors looking for a big return on their investment, this IGT slot certainly hits the spot. And I haven't even mentioned any 'reel' puns yet - damn!